disc disease, spinal stenosis, herniated disc and bulging discs. Have you been told that your bad discs can’t heal? Spinal discs do have built-in mechanisms for self repair. But, your bad discs will not heal with drugs, physical therapy, injections or surgery, because they are not disc healing treatments – and that’s why you’re getting worse. At The Disc Institute of Michigan, we have been healing discs for 9 years now with a 98% success rate, backed by medical research. You have been suffering from serious disc conditions, spending months and even years bouncing from one treatment to another, trying to find something…anything…that will relieve your pain. You’ve tried chiropractic, physical therapy, epidural injections, laser, and maybe even had back surgery in a desperate attempt to fix your problem. You might be surprised to discover that you haven’t actually been treating your problem at all. The real cause of your condition remains hidden from you, and your disc is still slowly dying…which is why nothing you’ve tried so far has provided lasting results. If this sounds like your situation, you are not alone. All of our patients have been in your shoes. But, after meeting with our doctors, you will became crystal clear on what was missing from other treatments, and how The Disc Institute is the answer for your serious disc problem. Watch this video to learn the difference between your condition and its root cause, so you won’t overlook the fact that there is a real problem that caused your condition in the first place…and the reason your condition continues to get worse. 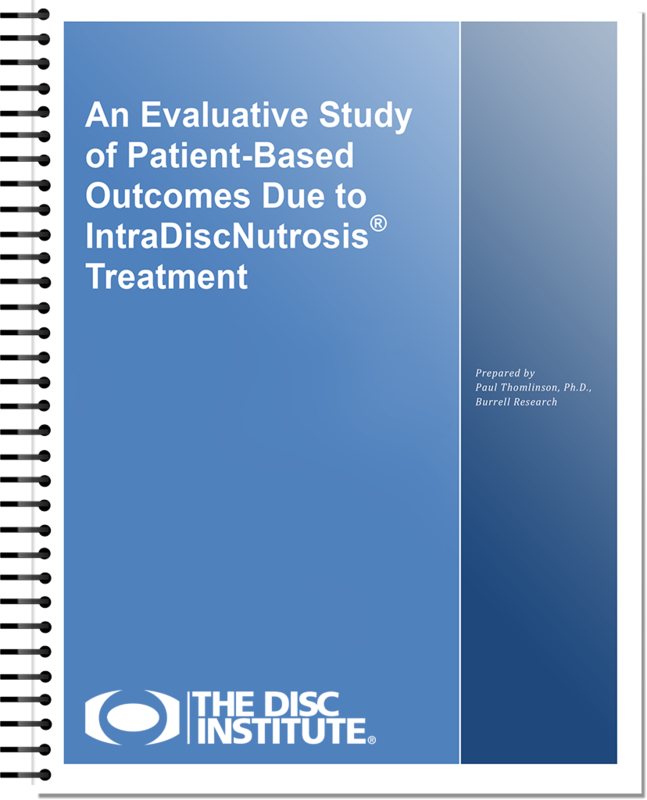 Dr. Paul Thomlinson, a Ph.D. research scientist specializing in health care evaluation, recently conducted two independent, third-party medical studies of the effectiveness of The Disc Institute’s IntraDiscNutrosis ® treatment program. The studies utilized sophisticated, random selection of a large and statistically valid sample of patients receiving care at The Disc Institute ®. 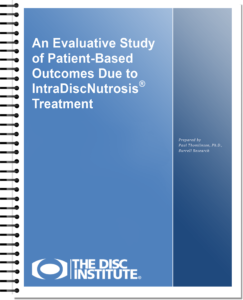 The results of his studies showed IntraDiscNutrosis ® is an effective and lasting solution for people with serious disc issues. If you are suffering from a degenerative disc, herniated disc, bulging disc, sciatica, or stenosis, it can feel like your condition is taking over your life. But just knowing what condition you have, and treating the symptoms that condition is causing, doesn’t correct the reason those conditions are there in the first place. And because your underlying problem has not yet been addressed, all of the other treatments you have tried so far (chiropractic, epidural injections, physical therapy, back surgery, etc) have failed to provide you lasting relief. The Disc Institute® is a unique treatment center that directly addresses the underlying problem, and has helped thousands of patients just like you avoid back surgery. Our IntraDiscNutrosis® is a medical breakthrough for treating sciatica, bulging disc, herniated disc or degenerative discs and serious disc-related symptoms without surgery. To avoid back surgery and find out if you are a candidate for IntraDiscNutrosis®, contact our office today. All of the following conditions are the result of a single underlying problem that has been isolated and identified by the experts at The Disc Institute of Michigan. The Disc Institute of Michigan is a unique treatment center that has helped thousands of patients just like you. Our IntraDiscNutrosis is a medical breakthrough for treating sciatica, spinal stenosis, bulging disc, herniated disc or degenerative discs and serious disc-related symptoms without surgery. The Disc Institute of Michigan has one primary goal: to help you avoid back or neck surgery. The Disc Institute team have personally developed this unique treatment and its protocols. And they have achieved the best solution with the highest patient outcomes, (backed by studies) in a setting that is focused on healing and repairing bad discs, while accomplishing lasting pain relief, with a positive impact on the quality of life for the patient. In fact, two independent, randomized, third-party medical studies confirm that The Disc Institute of Michigan has a 98% success rate in obtaining significant improvement and lasting results for their typical patients. Disc issues can affect anyone of any age, but the outdated standard of care does not address the cause, and that leads patients to ineffective and dangerous procedures like epidural injections and spinal surgery. Treatment at The Disc Institute of Michigan employs our own trademarked IntraDiscNutrosis. This is a non-surgical process that supports the simple biological fact that discs are comprised of living tissue, which has the ability to self-repair. IntraDiscNutrosis is a completely unique form of treatment that turns on the disc’s self-repair process: it is not physical therapy, chiropractic, pain management, epidural injections, or spinal surgery. There is no down time, no pain during the procedure, and no side effects. It is important to understand that treatment at The Disc Institute of Michigan may not be appropriate for every situation. Contact our office today to see if you qualify for our innovative approach to disc repair. 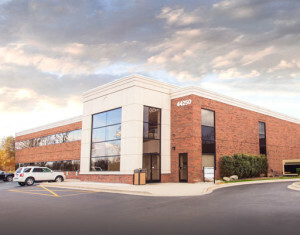 The Disc Institute of Michigan is uniquely focused on disc problems, conditions and symptoms. With 2 Locations in Michigan and Pennsylvania to help you avoid back surgery.